Click the button below to add the TOPRO - TROJA Classic- Xtra Small - Rollator Walker - WITH FOREARM SUPPORTS # 814741 - SILVER to your wish list. •Plastic coated aluminium tube and plastic couplings. •A total of 12 ball bearings in the wheels and forks provide excellent driving comfort. •Can be hosed and cleaned. •All wear and tear parts can be replaced and brakes can be adjusted. •Tested and approved according to EN ISO 11199-3 (walker standard). 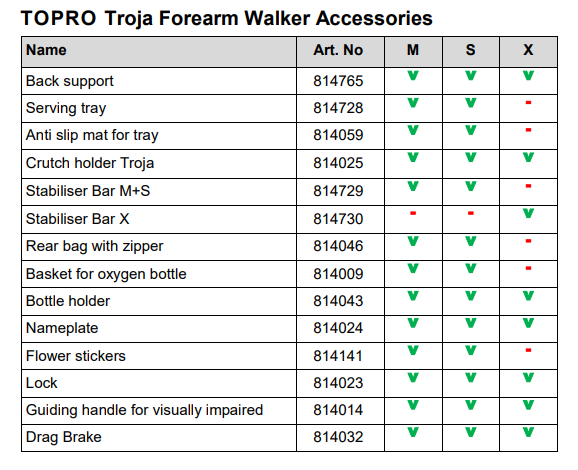 •TOPRO TROJA FOREARM WALKER is designed and approved to be used indoors on flat surfaces. •Pull the cord on the seat and the walker folds together horizontally. •Push the handle bars down into the side bars. •Unique memory function sets the handles back to the desired height. •Stands securely on its wheels when folded. •Takes little space and is practical to transport. •Easy to negotiate thresholds and kerbs etc. Diameter handles 3.5 cm / 1.37" 3.5 cm / 1.37" 3.5 cm / 1.37"
Maximum length 65 cm / 25.5" 65 cm / 25.5" 65 cm / 25.5"
Maximum width 63 cm / 1.2" 63 cm / 1.2" 63 cm / 1.2"
Width between support points 45 cm / 17.7" 45 cm / 17.7" 35 cm / 13.8"
Seat height 62 cm / 24.4" 54 cm /21.3" 50 cm / 19.7"
Diameter turning circle 84 cm / 33" 84 cm / 33" 79 cm / 31"
Diameter wheels 20 cm / 7.8" 20 cm / 7.8" 20 cm / 7.8"
Width wheels 3.6 cm /1.4" 3.6 cm /1.4" 3.6 cm /1.4"
Grip distance driving brake 6.5 cm / 2.55" 6.5 cm / 2.55" 6.5 cm / 2.55"
This product is custom-made by the manufacturer to suit your specific needs and is therefore non-returnable. 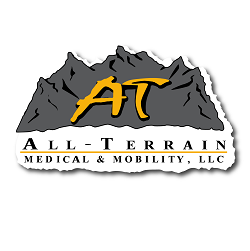 If you have questions about this product please call your All-Terrain Medical & Mobility Expert at 877.255.8371. I have camptocormia associated with Parkinson’s. When I’m on my feet I can’t straighten my spine. My back is almost horizontal and my face is more often than not down. People can’t see my face and I can’t see theirs’. This upright rollator allows me to see and be seen. It’s a sturdy construction and easy to transport. I put small cushions on the arm supports to rest my elbows on, but otherwise it has all the necessary accessories for me to take on daily routines with ease. It’s a good investment.